I wanted to get back by 6:00 or 6:30 PM, so Muffin and I left home a half-hour earlier than usual at 4:00 AM, and made the 2-3/4 hour drive to the trailhead. 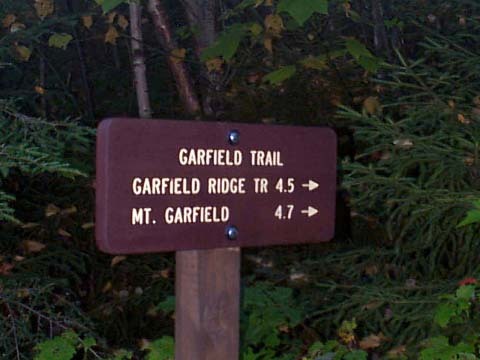 The Garfield Trail begins about two miles in on the dirt and gravel Gale River Loop Rd off Rt 3 just north of Franconia Notch. After calling home and locking up the car, we started hiking at 7:00 AM. 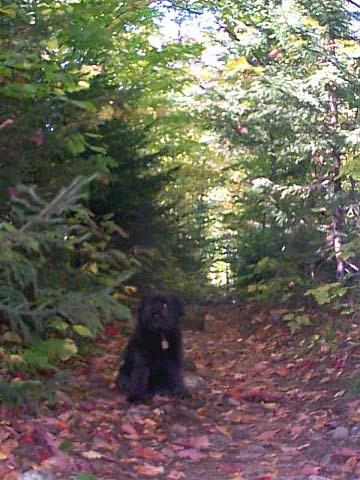 The trail began gently, angling almost imperceptibly upward through a mixed hardwood and hemlock forest. As I had recently gotten over an infection in my knee, I walked more slowly than usual, and I often had to call Muffin back when she got too far ahead. Somewhere to the right, I could hear the not too distant sound of flowing water, which was likely the South Branch of Burnt Brook. I believe that this brook gets its name from a huge forest fire that occurred on the north flanks of Mt Garfield around the turn of the century. The fall colors were not yet at peak, but they were pretty none-the-less, and the woods smelled damp and leafy. Most of the leaves were still on the trees, but some maple and many birch leaves were strewn along the trail. On this trip I was at somewhat of a disadvantage in that I didn’t have my altimeter watch as it was still with Suunto for repair. I had expected it back by now; I left it at Eastern Mountain Sports in mid-August. Since I had purchased the watch there, they had said they would send it back to Suunto for me. In addition to telling time, the altimeter always helps me gauge my progress upward. Anyway, I was hiking totally “blind” on this trip as I neither knew the time nor my elevation. 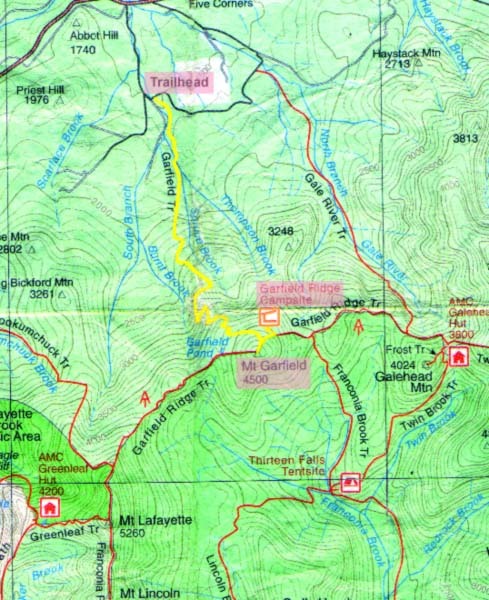 The trailhead for the Garfield Trail. The trail begins about 2 miles south of Rt 3 at a small parking area along the graveled Gale River Loop Rd. There were about 10 cars parked there when I arrived, but nobody else was around. Muffin on the lower part of the Garfield Trail. She did not want to sit still for this picture and I had to retake it a couple of times. The weather was near-perfect fall weather. The fall colors were not yet at peak, but there were red maple, yellow moosewood, and yellow and brown birch leaves strewn along the trail and on the forest floor.